The book of Esther has been taught and written about in great depth. Esther Royal Beauty by Angela Hunt has done a fantastic job of taking the story into a new facet and presenting a side of it that is refreshing and dramatic. 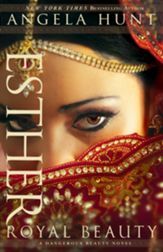 In the past, Esther has often been made into a shy, weakling of a child who was thrown into royalty but Ms. Hunt tells a different story and gives Esther not only a backbone, but elegance. The Jewish orphan raised by her cousin Mordecai, Esther dreams of great things just as many little girls do. She has a chance meeting with Queen Vashti and before she knows it, Esther is no longer dreaming of being in the palace, she’s a resident. But Queen Vashti is not the regal woman Esther initially thought her to be and Esther is given a reality check into the world of royalty where malicious crimes are committed by invisible hands. Esther also learns that love is much more than daydreams and physical touches. Love is a choice of the heart to defend, protect and think the best of another person. And in extreme cases, love requires laying down one’s life to save another’s. Although I’m already a huge fan of Angela Hunt’s writing, I must admit I was not especially excited about reading another book on Esther. However, I was very pleasantly surprised by this particular account of the book of Esther and give a five out of five stars all the way around.